San Rocco is staring impassively at me, pointing to a plague sore festering on his thigh. But I’m not interested. What’s caught my attention is the unique landscape behind him: row upon row of terraces that rise up a steep mountain, all sprouting grapevine hieroglyphs. In 1563, when this fresco was painted, those terraces would already have been hundreds of years old, ancient engineering marvels even then and a distinguishing feature of this alpine landscape. In that way, little has changed. 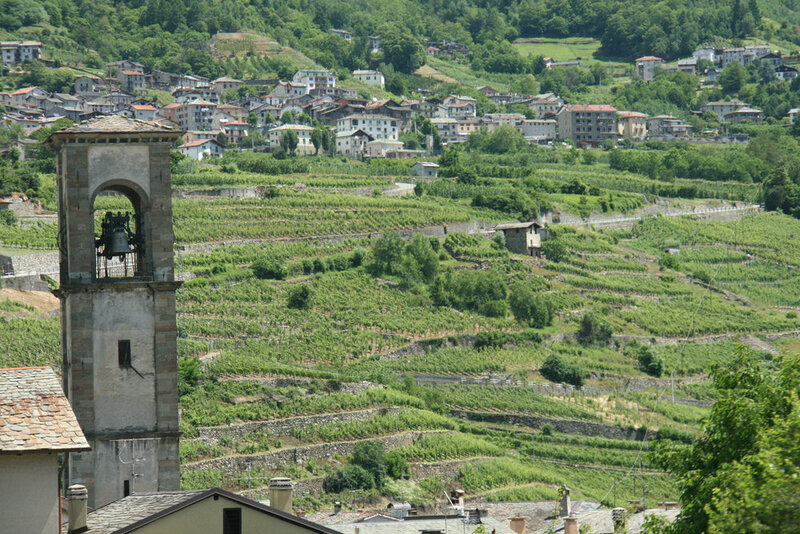 Valtellina, a 68-mile valley on the Swiss-Italian border, remains the largest terraced vineyard area in Italy. On its slopes are 1,500 miles of drystone wall, built from shards hacked off the mountain and alluvial stones hauled up from the valley floor. Hours later, I’m on one of those terraces with Matteo Borserio, agronomist at NINO NEGRI, the region’s largest winery. We’re traipsing around a prized viticultural subzone—one of five in the Valtellina Superiore DOCG. This one’s called Inferno, and it’s easy to see why. It’d be hell to work here. Though it’s the Alps, the sun scorches and heat radiates off the granite outcroppings and stone walls. The incline is so steep it’d make Dante throw in the towel. I spot prickly pear. “Another reason it’s called Inferno is because of those spines, which get in your hands,” says Borserio. As unlikely as cactus would seem at this latitude, they have other Mediterranean companions: palms, agaves, capers, rosemary. All signal the unique climate of this valley, one of only 10 to run east-west in the Alps. That alignment means its southern slopes bask in the sun all day. Which makes it perfect for slow-ripening Nebbiolo, Valtellina’s primary grape. Nebbiolo is most commonly associated with Piedmont and the Langhe, land of Barolo and Barbaresco. The fact that Langhe Nebbiolo gets the glory is partly the result of Italy’s political history. The architects of Italy’s unification in 1861 were from Piedmont, and they happened to be big champions of Barolo and winemakers themselves. Italy’s first Prime Minister, Count Camillo Cavour, sought to create a piemontese equivalent of Burgundy, while the King of Piedmont fell so hard for Barolo that he bought a couple of Langhe castles with vineyards to keep his cellars stocked. Claiming ownership of the grape, Langhe winemakers were in for a big shock in 2006 when researchers from the University of Milan produced evidence that Nebbiolo’s birthplace is not the Langhe, as had been widely thought, but either northern Piedmont (Alto Piemonte) or Valtellina. Nebbiolo—called Chiavennasca in Valtellina—has grown here for millennia, but the wine remains relatively unknown. In fact, it’s less visible today than a generation ago. “In the 1960s, we sold more Valtellina in the U.S. than we do now,” says Casimiro Maule, enologist at Nino Negri since 1971. “If I go abroad and ask around, no one knows it. They barely even know it in Milan,” which is rather scandalous, given that Milan is just two hours down the highway, on the far side of Lake Como. “Then there’s the other problem,” he continues. “Production is quite limited. So if we have to invest a lot to make ourselves better known, we don’t have enough wine to serve.” A dilemma indeed. When Maule stepped into the picture 41 years ago, he had his work cut out for him. The 1970s and 1980s were rough on Valtellina. The bottom fell out of the Swiss market, their most important, after Switzerland eliminated favored-nation tariff exceptions for Valtellina products. About the same time, the Swiss started producing their own red wine. Meanwhile, Valtellina wine had fallen into a slump quality-wise. The results were troubling: cellars full of wine that didn’t sell, growers giving up property, vineyard acreage shrinking, terraces crumbling. Step by step, Maule instituted change. (Founded in 1897, Nino Negri makes 850,000 bottles—one third of Valtellina’s production—and works with 300 growers. So any move it makes has deep ripple effects.) In the cellar, he reduced maceration times and replaced huge vats with French barrique, taking a page from Barolo modernists Elio Altare, Domenico Clerico, and Paolo Scavino. In the vineyard, he upended tradition by replanting vine rows in an east-west orientation, parallel to the slope. This introduced shade into the viticultural toolkit; by keeping or removing leaf canopy, the amount of direct sun hitting the grapes could be precisely controlled. Maule also introduced narrow caterpillar tractors for pruning and helicopters for harvesting. The helicopters alone nearly halved the man-hours required at harvest. But that’s still triple what’s needed in Tuscany. There’s simply no escaping the fact that working on these steep, narrow terraces is backbreaking. “One can define the work as heroic,” says Maule. Some consider him the hero. 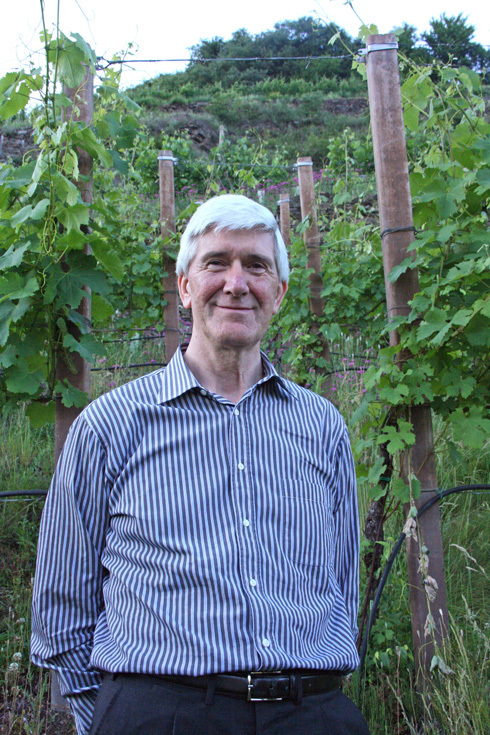 In 2007, Gambero Rosso named him Winemaker of the Year and his 5 Stelle Sfursat di Valtellina ($70)—an Amarone-style Nebbiolo made from semi-dried grapes, which Nino Negri was the first to commercialize in 1983—the Best Red Wine of Italy. Sfursat “is the maximum expression of Nebbiolo in Valtellina,” Maule says, and the 2009 and 1997 vintages of 5 Stelle he poured me over dinner were special indeed: at once intense and nuanced, with layers of red fruit, spice, and minerality. Truly a wine to savor and watch unfold. As much as the technological advances Nino Negri introduced, the Sfursat DOCG helped save Valtellina. But their other wines are pretty good, too. Nino Negri sources its grapes from all five subzones: Inferno, Sassella, Grumello, Vagella, and Maroggia. Each has its own characteristics, and some of Negri’s Valtellina Superiore wines play up the specific zone, such as Inferno ($25) and Le Tense Sassella ($38). Others blend several zones, such as Mazèr ($34). But all share a common thread, and it comes from the rock. Years ago, Valtellina’s largest winery was Pelizzatti. Founded in the 1860s, it was making 6-million bottles in 1973—the year Guido Pelizzatti Perego died. Though his son Arturo had worked by his side, the other heirs wanted the money, not the business, so they sold everything—the brand, the wine in the cellar, the land—except for some vineyards. This was during Valtellina’s bad patch. Guido’s granddaughter, Isabella Pelizzatti Perego, relates the history as we’re standing on a terrace in Grumello surveying what’s left. In front of us, new houses stretch to the main road on ground once occupied by the cellar. But underfoot is a brand new winery designed by Perego’s architect husband. Since developers couldn’t build houses on this steep stony slope, Arturo was able to buy this parcel back and start anew in 1983 with his 11 hectares of vineyards. The winery is called Ar.Pe.Pe.—Arturo’s initials. In 2004, he passed away, so now Isabella and her brother, Emanuele, run the show. Though production is small—50,000 bottles—they’ve managed to make quite a name for themselves. I first tasted their Rosso di Valtellina ($35) at a friend’s behest, who got tipped off by the savvy folks at Chamber Street Wines. I loved its dried rose and red fruit flavors, flinty minerality, fine tannins, and verve. Tasting with Perego at the winery, I’m even more smitten with Sassella Stella Retica ($40), a reserve (named after the edelweiss) that shows more concentrated woodsy fruit, and their scrumptious late-harvest Sassella Ultimi Raggi ($36). Though their architecture is modern, Ar.Pe.Pe.’s approach in the cellar is traditional. Since 2007, all fermentation happens in wood, and maceration is long—from 15 days for the Rosso to 40 or 50 days for the reserves. The top wines mature in oak for four years (the DOCG requires only two), then rest for three years in bottle. That’s a lot of years, but it’s just what the doctor ordered to calm Nebbiolo’s racy nervatura. Ar.Pe.Pe. is a bridge to a new generation in Valtellina. Other recently launched wineries include Dirupi, Giorgio Gianatti, and Alberto Marsetti. But their production is small. Nonetheless, any new blood helps counter the downward trend. Perego recites the dismal numbers: “Vineyard territory was at 5,000 hectares at the end of 1900s. It was 3,000 at end of 1970s. Today it’s 800.” Small, part-time growers supply 70 percent of the grapes. “This is a bit of trouble, because every time one of these old people die, we do not have a replacement,” Perego notes. The work is too hard and the terraces too expensive to maintain. Leaving Ar.Pe.Pe., I drive up to Sassella for a look. After several torturous switchbacks on the paved road, I turn onto a weathered lane that’s no wider than a donkey cart. Yes, this goes the length of Sassella, I’m told by a woman walking her dog—and yes, it’s for two-way traffic. I inch along, alternately terrorized by the heights (the guardrail seems no more secure than a satin ribbon) and enraptured by the terraces’ harsh beauty. But my mood is wistful. Though this landscape seems so solid—drystone on mountain, granite on granite—it’s actually a fragile place. This article first appeared in the Nov/Dec 2012 issue of Tastes of Italia.